This product is the secret to having rejuvenating hair after any color or chemical treatment. My hair is damaged and dry because I’ve been dying my hair since high school. With the Treatment Mask it has been helping me keep my hair look alive! It takes me just 5 minutes every morning to apply the Hair Mask while I’m in the shower. 5 minutes over dry hair is a deal I’ll take any day! My hair is very thick and wavy (latin hair). I seem to always lack conditioner in my hair to keep it moisturize. 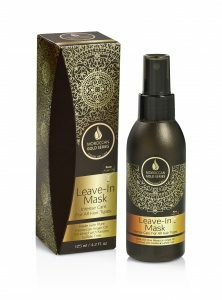 The Leave In Mask product is the perfect size bottle to keep in my purse. I’m always on the go! When I get out the shower and get ready for my day it’s easy to spray the Leave In Mask as I walk out the door. The product has just the right amount of Argan Oil in it to keep my hair looking shiny without it looking greasy. It makes brushing my hair more enjoyable since it also detangles it. The product mentions it’s “For All Hair Types” and it was not lying! I highlight my hair often and sometimes the end of my hair looks dead and dry. After using the intense care prodduct, my hair looks very hydrated. Thanks Morrocan Gold! It all began with a Moroccan argan oil brand that was co-created by our founder,who then created Moroccan Gold Series with the goal to produce a line of luxury argan oil hair products that tops every other company in the industry. The company improved upon the product their competition was offering in order to create the best results for women who use their product. The founders teamed with chemists to create the perfect blend of ingredients, eliminating the negative elements that other hair products caused. This led to the creation of best high quality, 100% pure argan oil hair products that are now being sold. All products are available on their website https://www.moroccangoldseries.com.